Marcus Mariota was the No. 2 overall pick in the 2015 NFL Draft. NASHVILLE, Tenn. (AP) — Titans quarterback Marcus Mariota returned to practice Wednesday, and the rookie said his left knee is feeling better. Whether he plays Sunday when the Titans visit Houston remains to be seen. The Titans officially listed Mariota as limited and want to be sure the No. 2 pick overall is recovered from the sprained MCL in his left knee when he plays again. Coach Ken Whisenhunt says Mariota took part in all of the individual drills and got better as practice progressed. But Whisenhunt sees this as a day-to-day process with everyone evaluating how Mariota feels Thursday. "You could tell he felt better and we’ll see where it is tomorrow," Whisenhunt said. "It’s good to have him back on the field." The Heisman Trophy winner hurt his knee Oct. 18 when hit low by Miami defensive end Olivier Vernon, and Mariota missed his first game last week in a 10-7 loss to Atlanta. Mariota had started the first five games for Tennessee. The Titans (1-5) are mired in a five-game skid yet only 1 games out of first in the woeful AFC South. Getting Mariota back against the Texans (2-5) could help across the board. 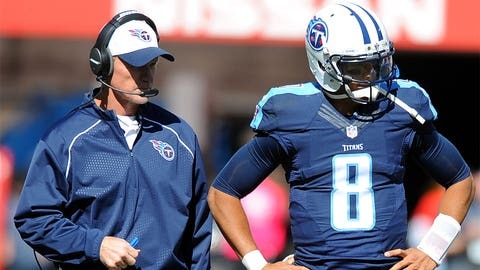 "Well, Marcus is a good football player, and we certainly want to get all of our players back on the field as soon as we can," Whisenhunt said. "But yeah, there’s got to be a sense of urgency to win. It’s been a tough stretch of weeks here, so we’d like to have everybody that we could possibly have to give us the best chance." Not playing was tough on Mariota, forced to watch from the sideline. The rookie from Oregon is smart enough to know that team trainers and coaches will make the final decision, even as he pushes hard to play. He knows they want to see if he can physically do all that’s needed to run the offense and move around in the pocket. He managed some handoffs and threw some passing routes. Mariota expects to add more work the rest of the week to test how he handles the extra work. The quarterback said he feels like he’s regaining his mobility, but isn’t sure yet if he’ll play Sunday. "Hopefully I can," Mariota said. "Again, we’re just going to kind of monitor the progress throughout the week. But it’s feeling good." Mariota worked with a brace Wednesday, something he wore when he sprained the MCL in the same knee in college in 2013. He said he likely would wear one in a game once he returns. Whisenhunt said doctors will make that decision. Zach Mettenberger filled in for Mariota last week and now is 0-7 as a starter. Mettenberger threw for 187 yards and a touchdown, but the Titans were just 1 of 9 on third downs with two turnovers. That offset a game where the defense allowed the fewest points since the 2014 season opener. Texans coach Bill O’Brien said who starts for Tennessee does matter because Mariota and Mettenberger are two very different quarterbacks. "You’ve got Mettenberger who’s a big guy, very strong arm, classic drop-back passer, a very good quarterback," O’Brien said. "And then you’ve got Marcus who is a guy that can throw out of the pocket, he can run. It’s just a whole different set of issues with him, so it’s very difficult." Notes: CB Jason McCourty (hamstring) and S Michael Griffin (left knee) also were limited at practice, and McCourty said he expects to play Sunday. NT Sammie Hill (right knee) practiced fully. CB Perrish Cox (hamstring), WR Harry Douglas (ribs) and C Andy Gallik (concussion) did not practice. Whisenhunt said they hope Gallik is cleared from the concussion protocol in time to play Sunday.